اکبری, پریا, گرگیج, شهاب الدین. (1397). اثر مکمل غذایی جلبک کلرلا (Chlorella vulgaris) بر عملکرد رشد، تغذیه و ترکیبات شیمیایی بدن ماهی کفال خاکستری (Mugil cephalus Linnaeus 1758). فصلنامه محیط زیست جانوری, 10(3), 153-158. پریا اکبری; شهاب الدین گرگیج. "اثر مکمل غذایی جلبک کلرلا (Chlorella vulgaris) بر عملکرد رشد، تغذیه و ترکیبات شیمیایی بدن ماهی کفال خاکستری (Mugil cephalus Linnaeus 1758)". 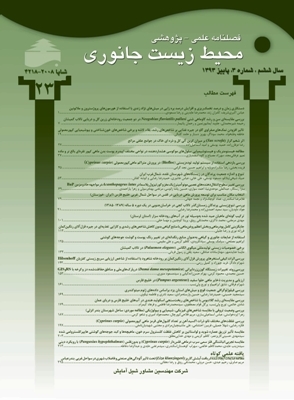 فصلنامه محیط زیست جانوری, 10, 3, 1397, 153-158. اکبری, پریا, گرگیج, شهاب الدین. (1397). 'اثر مکمل غذایی جلبک کلرلا (Chlorella vulgaris) بر عملکرد رشد، تغذیه و ترکیبات شیمیایی بدن ماهی کفال خاکستری (Mugil cephalus Linnaeus 1758)', فصلنامه محیط زیست جانوری, 10(3), pp. 153-158. اکبری, پریا, گرگیج, شهاب الدین. اثر مکمل غذایی جلبک کلرلا (Chlorella vulgaris) بر عملکرد رشد، تغذیه و ترکیبات شیمیایی بدن ماهی کفال خاکستری (Mugil cephalus Linnaeus 1758). فصلنامه محیط زیست جانوری, 1397; 10(3): 153-158. تحقیق حاضر به­ منظور بررسی اثر جلبک کلرلا (Chlorella vulgaris) بر شاخص­ های رشد، تغذیه (ضریب تبدیل غذایی، میزان غذای دریافتی، راندمان مصرف پروتئین، راندمان مصرف چربی) و ترکیب شیمیایی ماهی کفال خاکستری به­ مدت 60 روز صورت گرفت. در این مطالعه، تعداد 120 قطعه ماهی کفال ماهی با میانگین وزنی 2/01±14/95 گرم در یک طرح کاملاً تصادفی با 4 تیمار آزمایشی و 3 تکرار (با تعداد 10 قطعه در هر تکرار) مورد آزمایش قرار گرفتند. تیمار شاهد (بدون پودر جلبک) و تیمارهای آزمایشی 2، 3 و 4 به­ ترتیب دارای 5، 10و 15 گرم بر کیلوگرم پودر جلبک در غذا بودند. در پایان آزمایش، بالاترین طول نهایی 0/10±11/08 سانتی ­متر، میزان افزایش وزن به ­دست آمده 12/39±216/85 گرم، میزان رشد روزانه 0/18±6/53 درصد، نرخ رشد ویژه 0/07±0/90، کم ­ترین میزان غذای دریافتی 0/03±0/99 درصد، بالاترین راندمان مصرف پروتئین 0/24±4/37 درصد و بالاترین راندمان مصرف چربی 0/09±1/23 درصد در تیمار حاوی 5 گرم بر کیلوگرم پودر جلبک مشاهده شد که با تیمار شاهد دارای تفاوت معنی­ دار بود (0/05>P). بیش ­ترین میزان پروتئین خام و رطوبت در تیمار حاوی 10 گرم جلبک بر کیلوگرم غذا مشاهده شد. در مجموع براساس نتایج این تحقیق افزودن 5 گرم بر کیلوگرم پودرجلبک کلرلا به جیره غذایی ماهی کفال خاکستری به ­منظور بهبود شاخص ­های رشد (میزان غذای دریافتی، میزان رشد روزانه) و کیفیت لاشه در این ماهی پیشنهاد می ­شود. Abdulrahman, N.M., 2014. Effect of replacing fishmeal with Spirulinaspp. on carcass chemical composition of common carp Cyprinus carpioL.Iraqi Journal of. Veterinary Science. Vol. 28, pp: 67-70. AOAC. 1989. Assosiation of Official Analytical Chemists (AOAC). Official Method of Analysis of the Assosiation of Official Analytical Chemists, 15th ed. Assosiation of Official Analytical Chemists, Arlington, VA, USA. 374 p.
Bai, S.C., 2001. Requirements of L-ascorbic acid in a viviparous marine teleost, Korean rochfish (Sebaster Schlegeli) In: Ascorbic acid in aquatic organism. Dabrowski, K., (Eds.) CRC press. 184 p.
Bai, S.C.; Koo, J.W. ; Kim, K.W. and Kim, S.K., 2001. Effects of Chlorella powder as a feed additive on growth performance in juvenile Korean rockfish, Sebastes schlegeli (Hilgendorf). Aquaculture Research. Vol. 32, pp: 92-98. Choi, Y.H. ; Lee, B.J. and Nam, T.J., 2015. Effect of dietary inclusion of Pyropia yezoensis extract on biochemical andimmune responses of olive flounder Paralichthys olivaceus Aquaculture. Vol. 435, pp: 347-353. Ebrahimi Dorche, I.; Tangestani, R.; Alizadeh Dvghyklayy, E. and Zare, P., 2013. Effect of different levels of garlic essential oil on growth, feed and carcass composition of beluga (Huso huso) Rearing young. Journal of Marine Science and Technology. Vol. 11, pp: 1-12. Kim, K.W. ; Bai, S.C.; Koo, J.W. and Wang, X., 2002. Effects of Dietary Chlorella ellipsoidea Supplementation on Growth, Blood Characteristics, and Whole-Body Compositionin Juvenile Japanese Flounder Paralichthys olivaceus. Journal of the World Aquaculture Society. Vol. 33, pp: 424-431. Koo, J.; Bai, S.C.; Kim, K. and Kim, S., 2014.Optimum Dietary Level of Chlorella Powder as a Feed Additive for Growth Performance of Juvenile Olive Flounder, Paralichthys olivaceus. Journal of Applied Aquaculture. Vol. 11, pp: 55-66. Milledge, J.J., 2011.Commercial application of microalgaeother than as biofuels: a brief review. Reveiw Environmental Science and Biotechnology. Vol. 10, pp: 31-41. Misra, C.K. ; Kuamr, D.B. ; Mukherjee, S.C. and Pattnaik, P., 2006. Effect of long term administration of dietary â glucan on immunity, growth and survival of Labeo rohitafingerlings. Aquaculture. Vol. 255, pp: 82-94. Nick, G.L., 2003. Addressing human exposure to environmental toxins with Chlorella pyrenoidosa Medicinal Properties in Whole Foods. Townend Letter for Doctors and Patients. (http://findarticles.com/ p/articles). Pereira, R.; Valente, L.M.P. ; Sousa-Pinto, I. and Rema, P., 2012. Apparent nutrient digestibility of seaweeds by rainbow trout (Oncorhynchus mykiss) and Nile tilapia (Oreochromis niloticus). Algal Resrearch. Vol. 1, pp: 77-82. Porfaraj, V.; Karami, M.; Nezami, S.A.; Rafiee, G.R. ; Khara, H. and Hamidoghli, A., 2013.Study of some biological features of Mullets in Iraniancoasts of the Caspian Sea. Journal of Utilization and Cultivation of Aquatics. Vol. 2, pp: 97-110. Rahimnejad, S.; Lee, S.M. ; Park, H.G. and Choi, J., 2017. Effects of Dietary Inclusion of Chlorella vulgaris on Growth, Blood Biochemical Parameters, and Antioxidant Enzyme Activity in Olive Flounder, Paralichthys olivaceus Journal of the World Aquaculture Society. Vol. 48, pp: 103-112. Shalaby, A.M.; Khattab, Y.M. and Abdel rahman, A.M., 2006. Effects of garlic (Allium sativum) and chloramphenicol on growth performance, physiological parameters and survival of Nile Tilapia (Oreochromis niloticus). Journal of Venomous Animimals and ToxinsIncluding Tropical Diseases. Vol. 12, pp: 172-201. Wahli, T.; Verlhac, V.; Griling, P.; Gabaudan, J. and Aebischer, C., 2003. Influence of dietary vitamin C on the wound healing process in rainbow trout (Oncorhyncus mykiss) Aquaculture. Vol. 225, pp: 371-386.